Whilst fake news media outlets like CNN start the morning off by trying to say that President Donald J. Trump accomplished nothing whilst out on his Asia tour, they can once again be pinned for attempting to spew out fake news. Donald Trump has in fact, accomplished quite a lot whilst out on his tour of Asia, by strengthening relations with China, South Korea, Vietnam and the Philippines, as well as teaming up with them to talk about the North Korea situation. However, if it’s immediate results that you’re looking for, how about the three UCLA basketball players that Donald J. Trump used his influence to get freed from a Chinese jail, after shoplifting Louis Vuitton sunglasses in Hangzhou? They faced ten years in jail for their disappointing act of shoplifting, and it was Donald Trump who saw to it that they were released without charge and could be returned home. Shoplifting is a huge crime, especially in places like China. 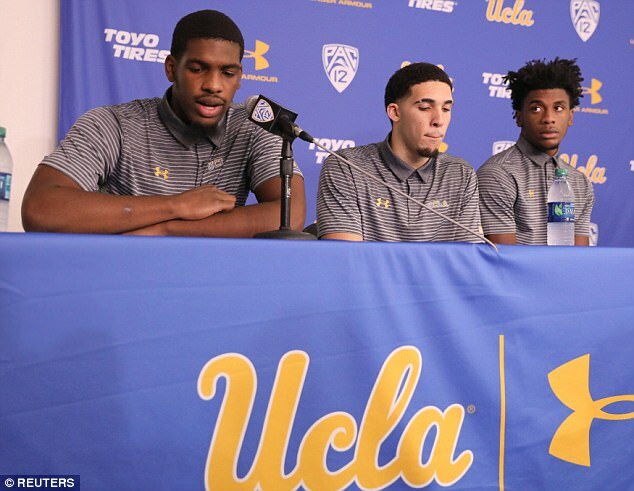 The three UCLA basketball players have personally thanked the President in a press conference after returning home on Tuesday afternoon, also after admitting to shoplifting in China. Seeing all the three shamed players, LiAngelo Ball, Jalen Hill and Cody Riley, apologising for their theft of LV sunglasses from a mall in Shanghai, all one can say is “what were they thinking?” and “this is beyond stupid”. Nonetheless, they did the right thing in apologising, saying: “I would like to thank President Trump and the United States government for the help that they’ve provided”. The special opening season exhibition game set in China was against Georgia Tech, and was played in Shanghai, an event which was meant to be remembered for basketball and not shoplifting. The most high profile of the players, LiAngelo Ball, is a predicted future NBA player like his older brother, and one wonders what they were really thinking? Could they not afford to buy the sunglasses, or was it just a real case of stupidity? We think it’s the latter. The players also thanked the police in China for showing them mercy and for treating them nicely, and they also apologised for their embarrassing actions as representative athletes of the United States of America in China. Let this incident be a life lesson to the three players, and let’s hope that they learnt something after being spared jail. The three players have also since been suspended completely from the UCLA basketball team, and what remains to be seen is just for how long they will be punished, and if they will face any further consequences for their terrible actions and lack of judgement whilst out in China as sports ambassadors for the NCAA college league in a strict foreign country. Meanwhile, Lavar Ball the father of LiAngelo Ball, claims that Donald Trump had no hand in the release of his son from the grans of Chinese prison. Erm… Ungrateful and moronic is the best way that we can describe Lavar Ball.